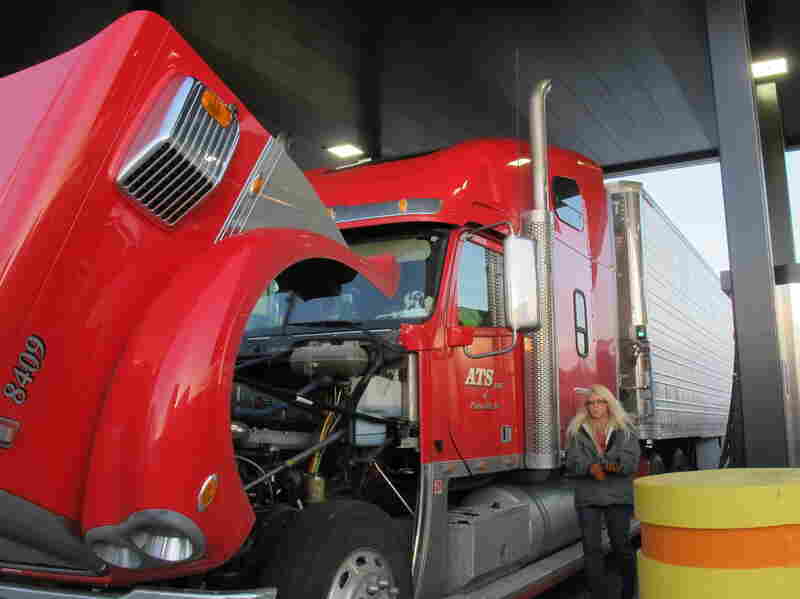 Trucking Shortage: Drivers Aren't Always In It For The Long Haul The U.S. has a chronic shortage of truck drivers — by one estimate, the trucking industry is short almost 50,000 drivers. If that number doubles as predicted, shipping disruptions will ensue. Wayne Berry is training to be a truck driver. The shortage of drivers is so severe that on his second day of training, he already had a job offer. But trucking companies say they are critically short of drivers — and many truckers say it's pay the companies are short of. "I retired from the Army in 2013," says trainee Wayne Berry. "I've worked four jobs since then, and nothing's really captured my interest as much as this has." "And then I got in touch with them, and they were like, 'Yeah, we'll take you.' So I have a pre-hire letter from this company," Berry says. "Anybody will hire him," Jeff Steinberg, who runs the APEX CDL school, says. "I would have recruiters get in knife fights for him out in the parking lot to try to get him to come to work for them," Steinberg says. "My driver shortage number right now is at 100,000. But it's a relative number," Perry says. For one thing, more than 3 million long-haul truckers work American highways. Perry says the current driver shortage isn't big enough to disrupt shipping all that much — but it is dampening growth, and companies are responding. "In the last couple of weeks, we've announced two of the largest pay raises in our company's history," Derek Leathers, president of Werner Enterprises, says. "We want 2016 to be the year of the driver for us," Leathers says. It's not just pay increases and signing bonuses. Trucking companies say they're working to get drivers home more regularly, and to cut aggravation on the job. "Companies go through drivers like oats through a horse. I mean, drivers are considered very much a disposable commodity," Spencer says. Drivers fill up at the Petro truck stop in Oak Grove, Mo. Because most drivers are paid by the mile, delays at stops eat directly into their earnings. "One hundred percent turnover means you had two people for every position. You just didn't keep them. That's not a shortage," Spencer says. "If you have a good driving record, you can leave a carrier today and have a job this afternoon," Costello says. But many new truck drivers don't last their first year — the job's too hard on their families, they make mistakes, and they don't earn as much as expected. "A shortage? I don't think there's no shortage in truck driving!" Broderick Vinson says, laughing. Filling up at the Petro truck stop in Oak Grove, Mo., he notes that most drivers get paid by the mile, not by the hour. That means that delays — at loading docks, in traffic, whatever — cut straight into their earnings. Veterans such as Gus Wagner say it's a tough lifestyle. "You ask a question about why there's a driver shortage," Wagner says, "and what it is, there's a pay shortage. Because why do you want to leave your house, leave your family, leave your kids, when you could make as much at a local job? It just doesn't make any sense."